Just some country boys and girls gettin’ down on the farm! 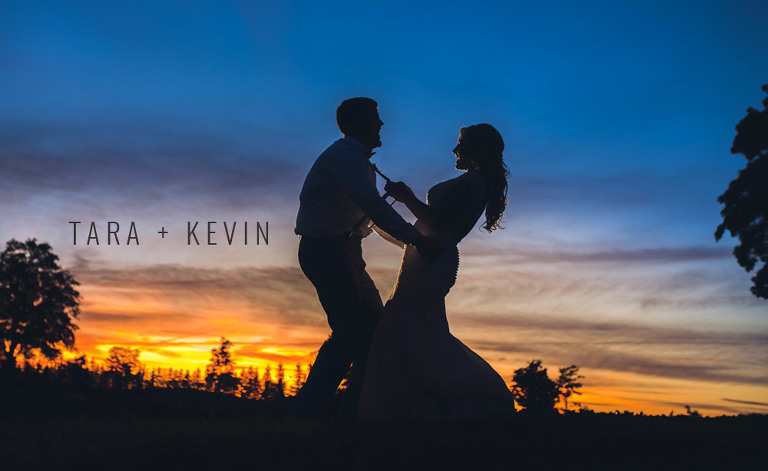 That was the unofficial theme for Tara and Kevin’s rustic barn wedding in Bradford. It was a day of fun, laughs and tears which they’ll touch on a little later in the post. And, I was honoured to meet the man himself, Drevin as the night wore on! Drevin is Kevin’s alter-party-ego… and he’s fun. This was also my first visit to this brand new barn wedding venue just outside Bradford called aptly, The Barn which dates back to 1906! They just recently leaped into the crazy-popular world of rustic barn weddings and it’s easy to see why. Their 113 acre property has a little bit of everything from corn fields, woods, stream and of course the focal point, their heritage barn which holds up to 220 people. They have a bridal suite on site and both indoor as well as outdoor ceremony options. It was the summer of 2005 – Kevin and I were going to a mutual friend’s house party. Upon her introducing us and getting to know each other, we realized that we were in the same year, at the same high school together & somehow had never crossed paths. One thing leads to another, we had a good time and life took us our separate ways. Fast forward 2 years and we found ourselves together again in many classes and at high-school parties; this time we knew we were meant to meet again. Kev was a lineman on the football team, I was a cheerleader. Cooking class taught us that Kev is clearly more domestic & gym class taught us that we’re possibly too competitive for our own good. We graduated, went to prom, life carried on and we couldn’t imagine doing it without each other, so we didn’t. As coincidence would have it, we ended up getting married on July 7th, which is Cassie’s birthday; the mutual friend who first introduced us, 12 years prior in 2005. Our first official date was Valentine’s Day, 2007 – how original. Kev was an hour late picking me up, apparently he was too busy trying to find the perfect gift, but If there is anything you need to know about the Boyd family, it’s that they’re always late. We’ve made many jokes that I would be waiting at the end of the aisle for Kev. Although, so far it seems as if I’m suiting the Boyd name fashionably – late. Tara: I can’t even think of one specific moment; we’ve been together so long I couldn’t even imagine life without him. We’ve gone through so many things together that people our age haven’t had to experience & likely wont for some time, including the loss of his Mother, the diagnoses of my Father, etc.. He is my rock & I am his. I just know that my life would look so different without him & I wouldn’t even want to paint that picture. Kevin: I don’t think I could narrow it down to a single moment. Like the title of the song for our first dance, our love was built from the ground up. We have been best friends since we were teenagers and have been through a lot together. We could be around each other 24/7 and still not get sick of each other and we have always been completely ourselves around each other. No masks, no lies, no pretending, no tricks. There was no need for that; we grew up learning about ourselves and life together. Kev & I have been together for quite some time, we have already had so many moments that I thought he was going to propose; we’ve been on a helicopter ride in to the Grand Canyon for brunch & mimosas.. We’ve gone on the most romantic hot air balloon ride over a small town near home, gliding over beautiful rolling hills of crops, etc. etc. so I didn’t get my hopes up when our 10 year anniversary was just around the corner & Kevin booked a surprise last minute trip to Cuba. The night before leaving for our trip he asks to go for dinner & a night skate in the heart of our home town where we’ve both grown up, I really didn’t want to. I begrudgingly agreed although it was late, I still had to pack my bags & it was -25 degrees outside. We went for dinner & headed out for a skate. Kev asks to invite his best friend, Vince, after giving me some sob story that we’ll be missing his birthday while in Cuba, so we should spend some time with him; again I agreed, Vince is commonly known as our third wheel – we are the Tripod. Little did I know that Kevin had already roped Vince in to ensuring he was there to capture the proposal. How it went down. Photo courtesy of the happy couple. The rink suddenly clears, I can’t believe it, this never happens; I make Vince take our photo because we know how rare this is. Kevin nervously skates back & fourth between Vince and I a few times, making sure that he has the phone recording, as if he hasn’t told him multiple times. Kev drops to knee knee, confesses his love and the rest is history! Tara: Besides those gorgeous blues, Kevin is the ying to my yang. He challenges me to be a better person every day in so many ways. Additionally, has this deep thought process that I can’t even begin to wrap my head around, he is the furthest thing from surface level. He has a way of digging deep and being able to see the bigger picture. I love that about him. Kevin: We balance each other. We have been best friends for a long time so we can be very similar, enjoy the same activities, and finish each other sentences; but we can also have very different personalities, which keeps our relationship interesting. I have always been quiet and relaxed while Tara is the opposite. We appreciate each other’s differences and understand it helps complement our relationship as a whole. On any given day our differences can bring out the best in each other. Tara: I don’t even know if I could choose JUST ONE! Umm, the Krispy Kreme donut wall?! .. Just kidding! Besides seeing my Groom feeling all of the emotions throughout the whole day, one of my most memorable moments has to be when I was able to pull him aside to show him I had secretly sewn in a piece of his late mothers wedding dress in to my own, in the shape of a little heart. He had no idea. His mother, Leena, means so much to us & still does, I’m so grateful I was able to bring a piece of her with me & honor her on our day. Kevin: The ceremon. Getting to watch my future wife walk down the aisle with her fathers on each arm; getting to stand in front of all our loved ones as we exchange vows, then finally saying “I do” to my best friend since we were two high school kids. Having the biggest party of our life with the people we love- Tara and I have both lost a lot of family and friends. Having everyone there was of major importance to us and to get both sides of the family together to eat, drink, and share stories was so special. Our first dance – We first told each other we were in love during the final song of our High School Prom, so fast forward 11 years to our first dance as husband and wife was something special. We took private dance classes for over a month before the wedding day to do something different, but just before the dance we realized the crowd around our dance floor would not give us the space to do our rehearsed steps, so we switched to the basics, but the dance lessons we’re surprisingly fun! I feel like many brides probably say this & I know it sounds so cliché, but throughout the planning process, don’t sweat the small stuff & it’ll all come together. Focus on the reasons you’re marrying each other & take that in. It’s easy to get caught up in the craziness of the planning & the wedding industry & I think going with the flow helped me stay sane this whole wedding prep – I knew I was marrying My Person & we kept that top of mind. Take it all in. There’s a lot going on the day of the wedding, take the time to soak it all in. Support your wife-to-be. The planning process and wedding day is very stressful for the both of you. Be active in the planning process to try and take some of the weight of the responsibilities. I had a lot of fun with the food tastings and helping design the menu. She is going to have the overall vision with how she wants the wedding to be and has probably been thinking about it since she was a kid; but back her up and aid her in making the dream come true. Offer your input as she may have missed or overlooked the small things while making the big decisions. Even something as small as creating the programs or helping with the seating chart. Make the guest experience an importance. Yes the day is supposed to be about you & your bride, but having our closest family and loved ones present at our wedding day is what help make our day even more special. Make them feel special and important for taking the time to celebrate with you. Make them comfortable, entertain them, and feed them well. Even something as small as the sun umbrellas and hand fans helped our guests stay cool during our toasty outdoor ceremony. Beware of the wine. I don’t know why they say wine is the girly drink, if you try to drink that like you would with beer, you’ll be in trouble. WHERE DID THEY FLY OFF TO ON THEIR HONEYMOON? We were SO last minute booking our Honeymoon & I don’t think we could have made a better decision. We went to St. Lucia & stayed at a resort called Ladera. I started researching honeymoon destinations a year before the wedding; I knew what we both liked from previous trips so I opted out for a travel agent. After many hours of searching we narrowed it down to St. Lucia or Bora Bora. After weighing the pros and cons of each, we decided upon St. Lucia. We fell in love with Ladera, which was one of main reasons we chose this island. Look it up! It was heaven on earth and pictures don’t even do it justice. We had the best honeymoon. WHAT MADE THEM CHOOSE THE BARN AS THEIR VENUE? Kim & her family, the Venue owners, are the kindest, most honest, hardworking, down to earth people we could have asked for in a vendor. It was evident that they genuinely care for their clients. Their venue & property is absolutely swoon-worthy, like something from a magazine, yet still held that true farm wedding vibe. The moment we stepped foot in their barn we knew that it was meant to be, we knew this was the venue of our dreams & the decision was made!